If you’re longing to trade your snow shovel for a lawn chair, take heart, spring is just around the corner. So it’s not too early to start thinking about making more space in your landscape for outdoor living. 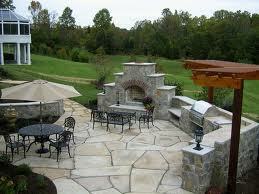 An easy way to to that is to add a patio to your yard. The first step in planning a patio is to determine what you’re most likely to use it for. Patio spaces can range from a simple outdoor spot to enjoy your morning coffee and the newspaper to a full-fledged cookout spot to entertain family and guests. With a patio you have almost unlimited options. It can stand on its own, perhaps surrounded and shaded by trees and shrubs, or you can incorporate structures such as pergolas and arbors. A free-standing fire pit or a built-in stone fireplace can add to your outdoor meal options. Once you’ve identified a patio’s main function, that makes planning its location easier. If it’s main purpose is for cooking and/or serving food, the best place is close to the house – adjoining a sliding or exterior door for convenience. If possible, no steps – or few – is best. If a quiet relaxing spot is more what you have in mind, then a shaded spot in a remote corner of your yard under some trees or near shrubs would be more appropriate. If you lack shade, a pergola, arbor, or vine-covered trellis can be added to your patio design. And if you want to have utilities such as gas, electric, or water, consider locating your patio space as close as possible to existing utility lines. After picking the spot comes selecting the materials. The best patio designs are ones that blend seamlessly with the rest of your landscape and home’s architecture and materials. If you’ve already got hardscapes such as flagstone or brick walkways, using these materials for a patio is a natural choice. And then there’s size. Once again, this is dependent on your projected main use. A central fire pit surrounded by a half dozen chairs will require more space than a secluded reading nook for one or two. Finally there are the shrubs, garden beds, and other plantings you want to accent your patio with. What you use will depend on a variety of factors, including whether or not you’re a fan of gardening chores or you’d prefer low-maintenance shrubs. Since putting in a patio is a somewhat permanent addition to your landscape, doing your homework and having a thorough plan thought through is vital. That’s where a professional landscape designer can be beneficial. At Architectural Landscape Design we specialize in hardscapes and outdoor living areas that complement both the homes and the lifestyles of those who enjoy them.